There are only so many protein bars you can eat before a hot meal is in order. To keep your spirits up and your energy levels high, there’s nothing better when you’re out camping, on the trail or up a mountain than a can of baked beans. For that, you’ll need a camping stove, but what should you look for? 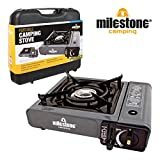 If you’re a novice camper or hiker, you might find that stove technology has moved on a little bit since you last went camping with your parents all those years ago. More environmentally friendly fuel sources can be used in portable camping stoves, including wood and other forest materials. There’s also size to take into account, how big you need your stove to be, how many people you’re planning on feeding, and so on. 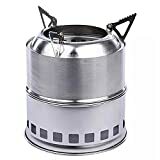 Other features we’ve covered in our camping stoves reviews include materials and sturdiness, as well whether a particular stove is windproof — terrible times will be had if your fire keeps blowing out. 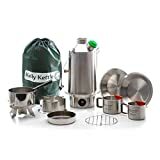 Our lightweight camping gadgets are great value for money, and can help turn a basic cooking stove, into a full-on dining experience. As always, we’ve chosen a balance between high quality and value, so you’re always assured great kit, whatever you choose. 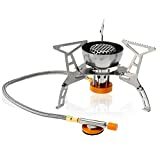 If you’re in the market for a camping stove, let Camping Things show you what’s hot. 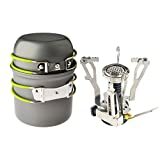 Be safe when using a camping stove. Never use one inside the tent, or near the entrance. Those porches on your tent are great, but keep the stove itself away from any loose material. Follow the instructions on your camping stove carefully, and never leave gas canisters behind when you leave — always take them with you. We take safety seriously at Camping Things, and we only ever choose products to review that we’re sure are of high quality. All of the stoves we’ve chosen to review here are fantastic, and we’d happily use any of them out on the trail, or on a weekend away. In our opinion these really are the best camping stoves. 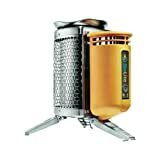 We’ve got ultra portable stoves, backpacking gas stoves, biolite wood burning stoves and cooking sets. Plenty to choose from, whatever sort of adventure you’re off on. Trust Camping Things to review only the best in affordable adventure kit. Whichever one of our reviewed products you choose, you’re assured a solid product.